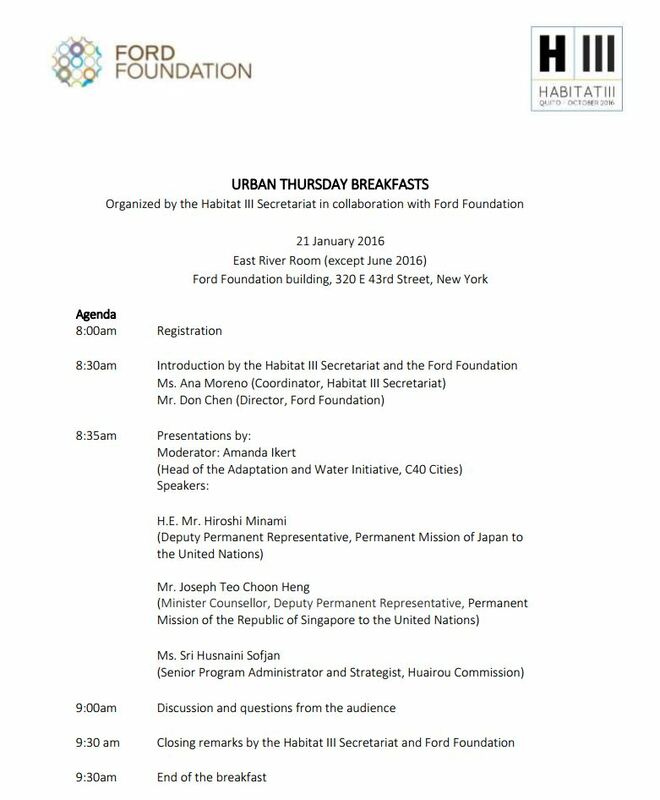 The second session of the Urban Thursday Breakfasts series in New York was held on 21 January, with a special focus on urban challenges and sustainable development in Asia and the Pacific..
Commencing discussions at the second Breakfast was Kumaresh Misra, Deputy Secretary-General of the Habitat III Conference, who spoke on the urgency of finding collaborative solutions to urban challenges in the developing world. The session was moderated by Amanda Ikert, Head of the Adaptation and Water Initiative at C40 Cities Climate Leadership Group, with an esteemed group of panelists: His Excellency Hiroshi Minami, Deputy Permanent Representative, Permanent Mission of Japan to the UN; Joseph Teo, Minister Councillor, Deputy Permanent Representative, Permanent Mission of the Republic of Singapore to the UN; and Sri Husnaini Sofjan, Senior Program Administrator and Strategist, Huairou Commission. The panelists introduced the main topics which connected Asia and the Pacific to pertinent issue of climate change and inclusive gender policies within the region.His Excellency Hiroshi Minami highlighted the excellent opportunity of Habitat III to reflect on sustainable development and put focus on Japan’s past trials in urbanization as a possible benchmark for other countries in the Asia-Pacific region. 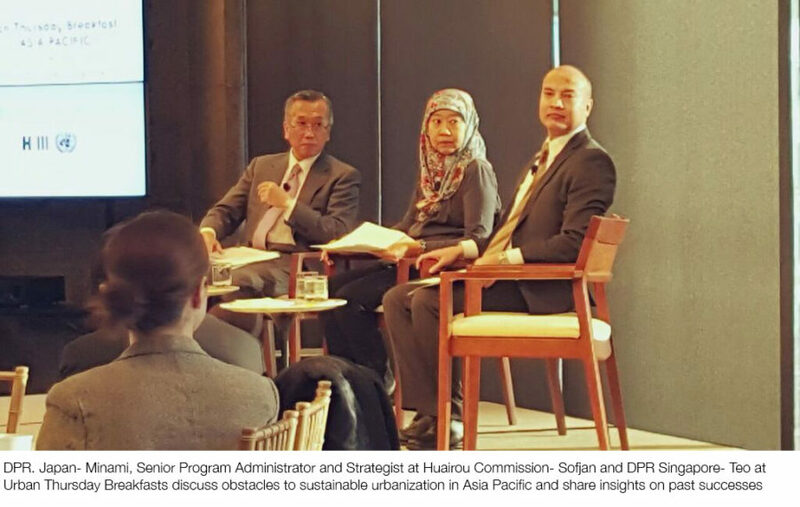 Joseph Teo of Singapore underlined the importance of a flexible and adaptive planning process, to which he attributed Singapore’s success and prioritization of public parks despite the city state’s limited land and a very compact and densely populated urban centre. Husnaini Sofjan from the Huairou Commission focused on the needs of women, children, and the elderly—and their role in helping establish the New Urban Agenda. Multi-stakeholder agreements, capacity planning, and government accountability were also discussed. Click here for a compelling glimpse of facts and figures showing the powerful impact of rapid urbanization in Asia Pacific. The next Urban Thursday Breakfast takes place on 18 February, with a special focus on the urban challenges and sustainable development in Africa. Videos of the sessions will be available on the Habitat III You Tube channel.